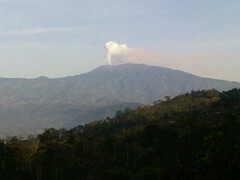 CRRTravel.com: Turrialba Volcano Might Re-Open? Image by Costa Rican Resource via FlickrI personally declared it volcano week since it seems to be the topic of this blog for the last couple of days it seems the local newspaper is lending itself to help me out. La Nacion the main news paper in Costa Rica which I consider the most formal and proffesional came out with the most unproffesional and informal article I could imagine. It was about the idea of re-opening the Turrialbal Volcano, you can read the article in Spanish here. If it is time to reopen the Turrialba volcano than fine lets do it but if its not than lets wait. I find it interesting that the only way to get to the crater in the rainy season would be for the US not to send warships down but to send some tanks down. The roads are horrible and with these rains I can imagine not much better. The roads in the article were not so much an issue in the article in arriving but during an emergency evacuation. The article then talks about how the volcano is letting out a lot of gas and that it could be dangerous to the tourist, uh? Does this mean like going to Poas and you should only stay at the crater for 30 minutes because of the gases being released or does this mean dangerous from the moment you arrive. The suggestion from La Nacion is that you would have to hire a tourism proffesional company to take you to the top of the crater to be safe. I've got news for you I run a tourism proffesional company and I dont have a clue when the Turrialba volcano is safe or when it is not safe I just go by what the experts tell me. Well I hope they dont open the park today but if it is open for the next high season I will be looking forward to it it would be quite the plus to any costa rican family vacation with the activity it is displaying and quite the free back massage with the road to get there.